The Hummingbird Bakery has done it again! Life is Sweet is the fourth book published by the infamous bakery and it’s out today! The book itself is gorgeous in the familiar pink color and packed with stunning photographs! It caters to a large range of baking skill. It is noted if more experience is recommended or not. However, I don’t think that should ever put someone off trying, if that’s what you want. It’s how we learn! Life is Sweet has 100 new recipes that showcase exactly what American baking is! Tarek Malouf noticed a lack of American Style baking in the UK and in 2004 he opened The Hummingbird Bakery. There are now five locations throughout London and now a total of 4 books packed with American style bakes. This new one does not disappoint! It has cakes and of course cupcakes along with a variety of pies, cookies and candies, pancakes, ice cream, puddings and even bread and other savory bakes. The graham crackers really appeal to me. It’s because S’more’s really cannot be made without graham crackers and S’more’s are really really good!! All the recipes I have found previously have graham flour, not to be mistaken with gram flour, and graham flour is hard to find over here. Everything I have ever baked from The Hummingbird Bakery books has turned out perfect. I have given Cake Days as a gift many times over to those who were looking to start out baking. It was the book that taught me a lot about baking. As an American in England it also gave me familiar and nostalgic bakes that I grew up with using UK measurements and ingredients. Which I was grateful for! It was the book that gave me the confidence to start my blog and share my baking experience online. I guess you could say I owe a lot to them! 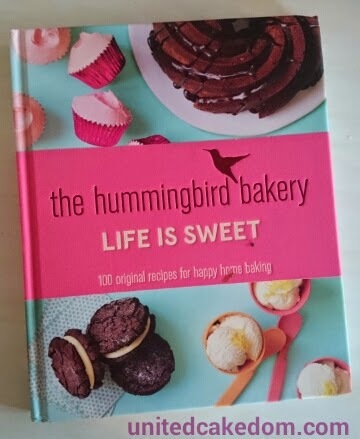 Life is Sweet will make a great addition to my baking book collection and I am sure it will get used as much as my other Hummingbird Bakery books have!! Thats a fair list of bakes you have there - certainly like the sound of the Strawberry Chiffon Pie.